In terms of switches what is the difference between a layer 2 and layer 3 one? Does a Layer 3 switch have a routing table and a layer 2 one doesn't? If im looking at switches 20,30,50 how do their tables look like? Does SW10 need to know the MAC address of both SW20 and A or does it just know the nearest hop ( SW20)? Can someone guide me step by step on what's happening here if a ping command is sent. There are some large issues with this network. Diagram: Let's start with the diagram. It's very unusual to draw an ethernet as a cloud. Clouds suggest "unknown and immaterial amount of networking equipment", and normally these are routers. Sometimes you draw clouds of switches, but that doesn't make any sense in a question about switches and their address caches. No routers: So-called "Layer 3 Switches" are not switches: they are switches with a router in the same box. You can also get switch modules for routers, which is a router with a switch in the same box. The difference between any configuration of router and switch and another is only performance and marketing emphasis: "you don't have a mere layer-2 switch you poor thing?". Be clear: a layer 3 switch is a marvelous thing, but it's not really a switch. No VLANs: You could split up your network with VLANs and so on, but you make no mention of it. You can see there are loops in this ethernet. Ethernet is not permitted to have loops, as the frames will go round and round. Whatever is the first frame out of A will go into switch 20 port 1. Switch 20, having empty MAC address map, will flood it out of all its ports 2 and 3, to switches 10 and 30. Those in turn will send to each other. Let's suppose 10 sends to 30 first, arriving on port 3. Switch 30 will flood it out of port 2 arriving at switch 20 port 3, which floods it out of ports 1 and 2. It will go around indefinitely. What you would normally see is all the lights light up on every switch, and no network traffic until you unplug or reboot something. Unless you disconnect some wires or introduce spanning tree protocol to do it for you, this network will not function. Notice the red lines on the original diagram: I'm guessing these are the spanning tree disconnections. Let's assume you introduce Spanning Tree Protocol on all the switches and the network has disconnected SW20 port 3 and SW50 port 3. _with all the assumptions in place, we can answer your question. Assuming all ARP caches and MAC-port mapping tables are empty. Remember ARP requests are broadcast, ARP replies are unicast. Command initiated on A to send a ping packet to C's IP address. ARP request arrives at C. C learns A's ether address. The ICMP ECHO REPLY goes directly C->SW40->SW30->SW10->SW20->A. If, A knew C's ether address, but none of the switches did (such as if they have just been power cycled), A will skip the ARP request, which is a broadcast. The first thing it would do is send the ICMP ECHO REQUEST, unicast. The actual frame forwarding would be the same as the switches would flood the echo request out of every port, just a like a broadcast, as it doesn't know where it is. 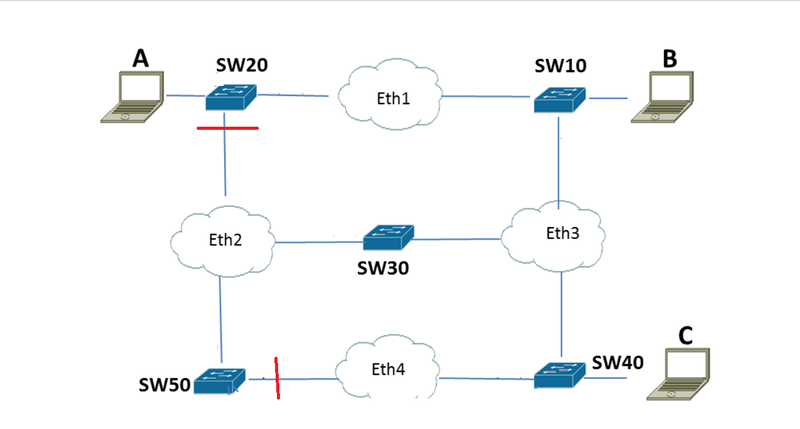 Your diagram is somewhat misleading - modern Ethernet uses point-to-point links, so SW10 would have two connections towards SW30 and SW40. As it is, your diagram indicates an obsolete Ethernet medium with shared access and multi-tap connections like 10BASE5. With point-to-point links, SW10 has two different links leading to SW30 and SW40 and accordingly, uses two different ports. Ping uses ICMP echo requests and replies which are transported over IP. In this network, IP in turn uses Ethernet frames for layer-2 transport. For this, IP uses ARP (IPv4) or NDP (IPv6) to resolve the destination IP address to the destination MAC address. Both methods will already populate the switches' MAC tables, so the actual echo requests/replies will get forwarded along the required path. When studying the basic functionality, don't bother about layer-3 switches. Basic switches use layer-2 addresses only. Routers use layer-3 addresses. Layer-3 switches incorporate router functions. Yes. The router in a layer-3 switch needs to have a routing table while a basic switch has no use for it (unless it features in-band management functionality). When some traffic has traveled across the network all MAC tables are populated, associating the end nodes' MAC addresses with the respective switch port they are connected with. On SW10, A's MAC address is associated with the left-hand port, B's and C's addresses with the right-hand port, and so on. Assuming basic L2 switches, the switches themselves have no MAC address, they are bridging transparently. PC A prepares for sending a ping/echo request to PC B. Since PC A & B share a common subnet, A needs to know PC B's MAC address. PC A sends an ARP request for PC B's MAC address. The ARP request is send as a layer-2 broadcast. This makes PC A's MAC address and its respective port known to all switches. PC B receives the ARP request and replies with its MAC address. The reply is sent as unicast to PC A's MAC - which the switches have already learned, so the frame is forwarded along the way to PC A.
PC B's reply is also used by the switches along the way to learn B's MAC address and the port its connected on. PC A can create the ICMP echo request, encapsulate it in an Ethernet frame addressed to PC B's MAC and send away. Alternatively, PC B could send the ARP reply as broadcast, making its MAC address known to all switches and other, interested hosts. Broadcast ARP replies are possible but not standard (similar to gratuitous ARP). Each switch only knows the associations for its own ports, ie. which one of its links leads towards the destination. Once you've grasped how layer-2 forwarding (bridging) works you can have a look at layer-3 forwarding (routing) - don't mix them, they are completely separate. If both PCs are on the same network, no routing takes place at all. Sw20 will receive the ICMP frame from PC A and forward the frame out the interface it knows PC C is connected to, or, if it doesn't already have PC C's MAC in the CAM table, Sw20 will flood the frame. The next switch in the network (let's assume that would be Sw10; the red line in your diagram implies that the link between Sw20 and Sw30/Sw50 is perhaps blocked by STP) will forward the frame out the proper interface following the same logic as before, again flooding the frame if PC C's MAC isn't in its CAM table. If PC C eventually receives the frame, it will respond and each switch will populate its CAM table accordingly. And you may have guessed that each switch will already know which port to forward the reply frame because PC A's MAC is now in the CAM table! MACs age out of the CAM table every 300 seconds by default (this value can be changed on a managed switch) on Cisco/Juniper/HP switches - I think this is very standard but I don't know for sure. Every time a host sends/receives any frames the timer is reset by the switch. Not the answer you're looking for? Browse other questions tagged ethernet arp ping or ask your own question. Why do I see “ethernet” keyword in my wlan0?